Are You On The NSA's List? This wasn't the only place I'd read that journalist Glenn Greenwald was going to publish names of people targeted under the National Security Agency's surveillance program. The announcement on that page was made Tuesday. I checked Greenwald's Intercept page but it hasn't been updated since last week. Where's the names? I wanted to see if I was being watched. Anyone else find the list elsewhere? I'm also dying to know if I'm on the government's no- fly list, but I guess you can't find that out until you try to get on a plane. Update: Just found this article that says the list will be released "this summer". "Senate Bill 1253 would create legislative hearings as initiative proponents are gathering signatures on their measures, allowing lawmakers to negotiate with interest groups before a measure lands on the ballot. It would also require more disclosure of donors giving the most money for and against initiatives." Seems harmless enough except we started the initiative process so the voters could take action when the legislature doesn't. This is one of those glass half empty- glass half full things. They might well make some needed changes to initiatives. They could just as likely screw them up. 1- A ballot initiative should only involve one specific thing. For instance, there's one coming up on the November ballot that will raise medical malpractice awards. But it also has something in it requiring drug testing of doctors and I believe at least one other element. That should be a no- go. People shouldn't have to chose between all or nothing. The medical malpractice initiative should be at least two separate initiatives- raising the awards and drug testing- each dealing with a particular action. You wouldn't have to vote for one if you weren't happy with the other. 2- Initiative text should fit on a single legal size piece of paper using a readable font, with room for desired voter signatures. If the initiative details won't fit on a legal size piece of paper, it's obviously too complex or does too many things. Anybody remember the indian gaming initiative when it was being circulated? I do, as I was one who gathered a few signatures for it. I don't know how many words that initiative contained, but the petition had to be folded like four times to make it the size of a regular piece of paper. The font was so small it was unreadable to the naked eye. That initiative could have just said, "Native American tribes are allowed to have gambling on reservation lands or lands immediately adjacent to them", or whatever the actual limits were. You could have added a bit a bit more to make a full paragraph. No need for all the rest of the text that required six or more separate pieces of paper. Those are my proposals and I think they'd be for the better. Some might point out that the state legislature and congress regularly pass laws that include any number of mandates and actions. I suggest we'd probably be better off if they adopted my proposals, too. Some good points were made in this Daily Caller article that asks if America is starting to target thought crimes. Starting? We're past that point, imo. But maybe it's not as bad as I think? I was pleased to read of this court decision from last year that confirmed a students right to say he doesn't "accept gays". To summarize, a high school is participating in a campaign trying to raise awareness of bullying of gay and lesbian students. Support for the effort is shown by wearing purple clothing. As students enter a class, the teacher notices a girl with a confederate flag belt buckle. He asks her to remove it. She does. Another student questions why she had to remove the buckle. After all, the teacher is wearing a purple shirt. The teacher explains the purple shirt is expressing support for good things and the confederate flag is a bad thing. McDowell “then asked [Daniel] if he accepted gays or not. [Daniel] said he did not.” At this point, “[McDowell] threw [Daniel] out of class and wrote up a referral for unacceptable behavior.” At this point, another student asked, “I don’t accept gays either[,] can I leave[? ]” McDowell said yes…." I'm surprised the court upheld the student's right to say he doesn't accept gays, especially when you consider recent decisions that force people to serve someone or a group that they find offensive. There must be a number of similar cases a year in this country. I wonder how many of them rule in favor of individual opinion and free speech, and how many rule to the contrary? Hat tip to the Humboldt Center for Constitutional Rights that provided the link to the story. This fellow over at Reason magazine makes a case to ban volunteering that might appeal to many Californians. Hey, we don't allow people to work for less than minimum wage. Why should we let them work for free? A new study has found solar power not only converts sun rays into electricity but is also draining the sun's energy from it. Oh, NO! The Kerrigan Club: NO TRAIN! Actually, I don't recall whether Chris Kerrigan and I spoke about any of the proposals to restore rail service to Humboldt back when he stopped by my house a while back. I do know his supporters over at the Tuluwat Examiner are opposed, at least if it does anything but haul a few passengers. The latest proposal from rail supporters seems to be hauling oil. Whether that would work, paint me as skeptical. Funny thing is, you can bet 9 out of 10 of the Kerrigan folks support the Governor's High Speed Rail plan. That plan has no higher ambition than hauling people to the same places they're already going to do the same things they're already doing. But new commerce? NO WAY! We can't have that. I've already gone on record as saying I don't think a rail line from here to the east or south is feasible. I question whether the bay is big enough to handle the traffic and, most important, this is California- the State of NO. And it is that way in large part because of the kind of folks we see in the Kerrigan Club. I respect and admire those that are trying to bring new commerce to the area and wish them well. Some of you might enjoy this Sacramento Bee article which discusses controlling invasive species by making them into food. The lionfish seems to be one success story. Feral hogs aren't. I stopped by the Burger King in north Eureka yesterday to get an iced tea. It was the first I'd noticed that the McDonald's across the street had been torn down. A whole bunch of construction workers all over the lot where it once stood. The wife was surprised when I mentioned it so I guess I'm not the only one that had no idea. I don't recall reading anything about it in the news. Anybody know what happened or what's going on? Here's a Change.org petition encouraging past two- term Governor of New Mexico (and 2012 Libertarian Party presidential candidate), Gary Johnson, to run again in 2016. He'll likely be the only fiscally conservative and socially tolerant one running. You lefties might want to sign this one, too, especially if you're one that believes libertarians just take votes from the Republicans. Rand Paul? I highly doubt he'll get the Republican nomination. He'll likely get the same treatment his father did. As I read the list I couldn't help but wonder if I remembered to sign, date and fill in my street address on the envelope. OH, NO!!! Nah, I remember doing that. "You can find out if your vote was disqualified before it is too late by going on the elections department website and plugging in your name and driver's license or ID card number. "It'll tell you if your vote-by-mail ballot has been challenged," said Crnich. You can do that as early as 28 days prior to Election Day, giving you plenty of time to cast another if there was a problem." I didn't know that. I just sent in my mail ballot a few days ago. Probably too early to tell if my ballot was contested but I thought I'd go through the motions. I went to the county Elections Division web site to find the link to submit my info. I couldn't find it. Hmmm...is it just me? I should probably go in and make sure my signature is still acceptable. I'm not sure how long it's been since I renewed it. Years ago I went in to Elections for one reason or another. I remembered to ask the gal working there if my current signature matched the one they had on record. She compared them and said there was too much of a difference and they wouldn't accept my current signature compared to what they had on file. Something to keep in mind. I know my signature changed completely over the last four decades or so. Probably the same with most people. How did I vote? No surprises. Voted Bass, Fleming and Downey. Left the other county races blank. Skipped the Governor's race and some of the others. I did vote for Jonathan Jaech, the Libertarian Party candidate for Attorney General. Anybody but Huffman in the congressional race had me voting for the Republican, Mensing. Anybody but McGuire for state senator had me voting for Wiesner. Probably the first time ever that I've voted for him. Oh, and a resounding NO on Prop 41, that veteran's housing bond. Skipped Prop 42, the open meetings thing. Figured I'm post this before anyone else did. 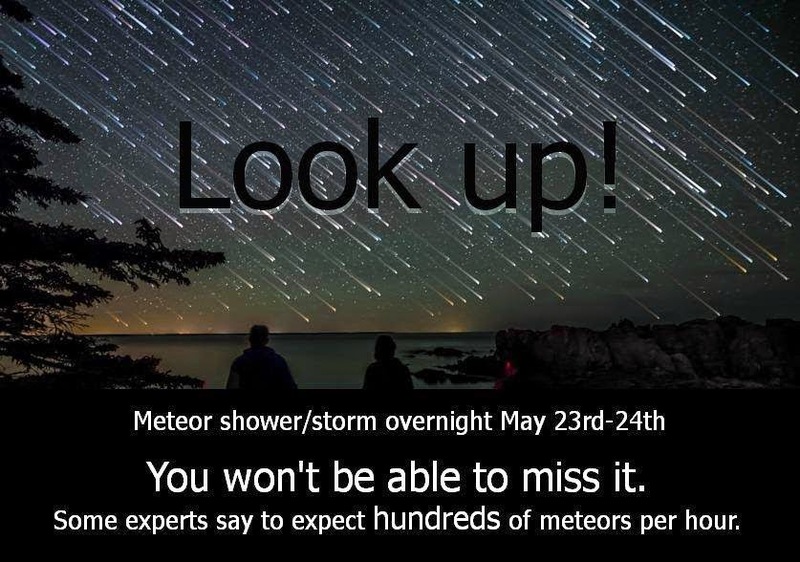 A meteor shower we might not have seen before. For more info, click here. That's not good. It's also not good that this is the first we've heard of this. I would think this should be a major issue in this race. One aspect of this I'll differ on is Klein suggesting that this was Gallegos' idea. There's no doubt in my mind these rather bizarre goings on in the D.A. 's office weren't the brainstorms of Gallegos, but of now retired head of D.A. investigations (and past Humboldt County Sheriff candidate), Mike Hislop. Hislop wanted to create his own police department, not Gallegos. Addendum: I could have sworn I'd commented here before about the D.A. 's office wanting to get AR15s and form a SWAT team, or some such. I can only find this one post that's just as much about goings- on in Mendocino County as it is Humboldt. Addendum 2: Received notice from someone in the know that the figure for current investigators isn't correct. I was pointed to this North Coast Journal article that includes figures at the bottom of the story. Still, if Klein's assertion that the usual ratio of investigators to attorneys is more like one to five, that would mean we have over three times more than the norm . The Times- Standard hasn't updated their web page in at least a day. Has something gone horribly wrong down there? "Some ingredients used in Knudsen Cottage Cheese, Breakstone's Cottage Cheese, Simply Kraft Cottage Cheese and Daily Chef Cottage Cheese were not stored in accordance with proper temperature standards at a Tulare manufacturing facility, they said." I might not have bothered posting this except the wife bought four or five tubs of the Simply Kraft Cottage Cheese recently at Eureka's Grocery Outlet. The date stamps match those being recalled. We've eaten all but one with no problems...at least so far. For those of you that have some and are worried about it, take them back to the store for refund or exchange. I haven't seen it reported elsewhere so you may have heard it first here, folks. Richard Rider reports defense contractor Pratt&Whitney is leaving San Diego and headed to greener pastures taking 530 jobs with them. Texas again? Maybe not. They're also considering either Georgia or Florida. Neat video here of a cat that defends a child from a vicious dog. Quite remarkable. Ooops! Maybe it's not working anymore. I just tried it and it says the video is private. Worked fine last night. Watched the League of Women Voters' forum for 4th District Supervisor last night on KEET. No surprises there. Chris Kerrigan went through his boilerplate anti- development lines, harping on the board being overly influenced by developers. Virginia Bass rightfully pointed out there isn't a problem with sprawl in the county. Both seemed to try and appeal to the Left by supporting a local increase in the minimum wage and a plastic shopping bag ban, if memory serves me correct. Aside from that, nothing memorable. Kerrigan seemed to me the fringe candidate. Bass as more the thoughtful and pragmatic one. I'll vote for Bass, but as the lesser of two evils. I'd almost rather stand aside on this one. "The rise in expenditures comes almost exclusively from employee salary and benefit costs. Retirement and health care costs are expected to rise by $1 million, while three new positions will add another $300,000. Another $1 million in salaries was moved to the general fund this year as part of a different accounting method, but isn't actually new spending. Of Petaluma's general fund, which pays for most city operations and where most of the council's discretionary spending exists, 79 percent is spent on salaries and benefits. The police and fire departments budgets account for 72 percent of the general fund." I again can't help but wonder how Eureka's budget numbers compare to theirs? Getting Ugly in Cotati Over Tax Increase? Things seem to be getting ugly in the Sonoma County town of Cotati over a ballot measure to extend, and double, a half cent sales tax increase passed in 2010. Supporters of the tax extension claim it was loss of redevelopment funds, among other things, that fueled the need for the tax extension and increase. The Santa Rosa Press- Democrat reports a local gadfly was circulating fliers with alleged false quotations from supporters of the tax. Some of those quoted are considering legal action against the former city councilman who printed them. The guy in question, George Barich, has his own local blog. Looks like local Cotati politics are a bit nastier than those up here if you read the comments to the story. Small town like that, makes me wonder if some of those folks engage in fistfights when they run into each other around town? This is exactly the sort of thing that concerns me about Eureka's Measure O extension. A temporary tax increase is passed. It doesn't take long before that's not enough and they feel the need to not only extend, but double it. Hard for me to believe the same thing won't happen here. Another large city, has discontinued fluoridation of its water supply. It seems the main reason Dallas is stopping the practice wasn't any real or imagined effect on health, but economics. The city will save a million dollars a year by not fluoridating. That's a good point, but not the one I've been arguing. It should be matter of personal choice, especially when there's any number of ways to ingest fluoride if someone wants to do so. I've wrote before that fluoride wasn't even on my radar two or three years ago. I'm still not all that concerned about its supposed health effects. Eureka's water has been fluoridated since long before I moved here. I first got interested in fluoridation reading of Sonoma County's plans to fluoridate their water. I was appalled at how many seemed determined to force it on those who didn't want what is essentially industrial waste put in the entire water supply. The individual choice argument doesn't go over well in California, especially in the Bay Area. Maybe economic considerations will sway more minds? I stumbled upon the League of Women Voters' forum for candidates of the 2nd State Senate district on KEET last night. I wasn't really interested in watching it at the time. To my surprise, the wife seemed interested, so we watched. Front runner by all accounts, Mike McGuire, was clearly the most comfortable with the camera. He rattled off a number of boilerplate issues he felt most voters would agree with such as removing the Klamath Dams and opposing the Governor's plan for twin tunnels to facilitate water delivery to Southern California. Twice he brought up various endorsements he'd received. I wasn't impressed, although I appreciate people who speak well in public. The wife pointed out he sounded like a real estate salesman. Never mind I disagree with him on most issues I'm aware of. He doesn't go to the bottom of my list for that race. He was already there. The other three candidates were present: Lawrence Wiesner, the perennial Republican candidate. Harry Lehmann, the No Party Preference guy and the other Democrat, Derek Knell. None seemed as comfortable with the camera as McGuire did. I found at least one or two positions both Lehmann and Knell brought up I disagreed with. Sorry I didn't take notes because I can't recall what was said and who said it. I might have disagreed with a few of Wiesner's positions, too, but he gave the most generic responses that didn't allow much specific disagreement. I believe he was the only one that brought up improving California's business climate, though. That is good, but probably not realistic considering the people that live in this state. Lehmann pointed out at least once he was independent and not beholden to any political party. Knell actually brought up towards the end that, while he was a Democrat, that was because he'd always been one but he was his own man and also independent. Interesting to see them playing the "I'm not one of them!" game. After an hour, all I can say is anyone but Mike McGuire. He's the statist, business as usual candidate. As far as the other three, it's between Lehmann and Wiesner for me. Not sure who I'll pick come June. Maybe I'll just toss a coin, although I would like to see an NPP candidate in the runoff. The League of Women Voters' Smartvoter web site has yet to list any candidate web pages. This story on the gubernatorial candidates from the San Jose Mercury News actually includes the candidate's campaign page links at the bottom. That's good because I don't think I'd have the time or desire to look them up on my own. I've already taken three candidates off my consideration list after reading the story, four if you count Governor Brown. Buycks, Champ and Agbede go to the bottom of my list. That leaves 10 more to look at (Republican Andrew Blount withdrew from the race). If I get some time I'll take a look at the other candidates. If I don't get time, it won't bother me to stand aside on that race in the primary. "I would argue that there’s no reason to believe lethal injection is a more humane way to end a life than electrocution, poison gas, hanging, firing squad or even guillotine. Of course, we’ll never know. We can tell ourselves any story we want about how quickly and painlessly death arrived, and the one person who could prove us wrong will never speak again." I've wrote here before I'm generally against the death penalty. Robinson is spot on. Only in America do we quibble over the means by which we kill people. If you want to kill someone, the old ways worked fine. Along that same line, the San Francisco Chronicle's Debra Saunders points out the irony of the messed up execution being the end result of efforts by death penalty opponents. This fellow from the Center for a Stateless Society points out it wasn't a "botched" execution. It was a failed experiment. He also proposes more simple ways of killing someone. I blew it when I went to City Garbage yesterday. Had to dump a pile of green waste I had in the back of my truck so decided I'd also get rid of an old tire I had sitting in the garage. I thought last time I went to the recycling center I saw something saying they'd take up to a certain number of tires for free. Nope. Maybe it was car batteries I saw mentioned? They take a certain number of those free. I get to the recycling center and the guy says I need to take the tire next door where you dump trash and green waste. I head over there. Didn't see any prices for dumping tires except something saying it depended on how many tires you had. Get to the scale and the guy tells me tires go with regular trash. I dump the tire, then go dump green waste. That's when I realize I shouldn't have dumped the tire because now I'll have to pay for the weight of the tire as well as the green waste, plus whatever individual charge there is for the tire. Damn! As the scale guy is weighing me he explains there's a minimum charge of $12.00 for regular garbage. That included my one tire, plus an additional charge of $5.25 for the tire. Not only that, but I'm charged regular garbage weight charges instead of green waste weight charges. Regular garbage is much more expensive than green waste. I blew it. And I guess it wouldn't have mattered. If I took the tire in by itself. I'd still have to pay the $12.00 minimum, plus the per tire fee. That still would have been around $17.25 rather than the almost $22.00 I ended up paying. If I'd just dumped the green waste it shouldn't have cost more than about $7.00. I was kicking myself in the head as I drove off. If nothing else, I had other large stuff at home I could have thrown in as solid (regular) waste that could have been included with the $12.00 minimum. Now when I end up dumping that stuff I'll have to pay another $12.00. And the tire? I should have just taken that to Les Schwab Tire Center. Last time they took a tire I had for no charge. Think before you dump!